There are many way to clear a clogged pipe, but is a chemical drain cleaner safe for your septic system? It depends on how you use it and what brand of cleaner you use. 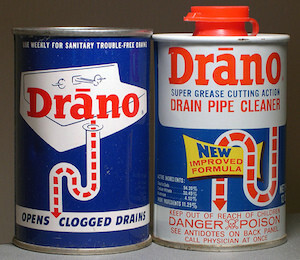 Just because a chemical drain cleaner like Drano is labeled “plumbing safe” does not automatically mean it’s septic safe. Harsh chemicals can affect your septic system’s health, so it’s important to monitor what you send down the drains. Before you resort to a chemical drain cleaner, try mixing up a batch of 1/2 cup baking soda and 1/2 cup of vinegar. Pour that down the clogged drain and follow it with 2 cups of boiling water; this can clear a blockage easily and inexpensively. I doubt that one or two careful uses of a chemical like Drano will do much harm to your septic system, but if your pipes are prone to clogging I recommend hiring a professional plumber. He or she can auger any backed-up pipes without putting your septic system at risk, and may even be able to use a camera to inspect your pipes for any problems that may be causing the recurring clogs. We offer free phone consultations to anyone who might need help with their septic system. Give us a call, we’d love to help!